For many animals Hiding is the only way of staying alive: sometimes it's to fool hungry enemies and sometimes it's to creep unseen upon luckless prey. 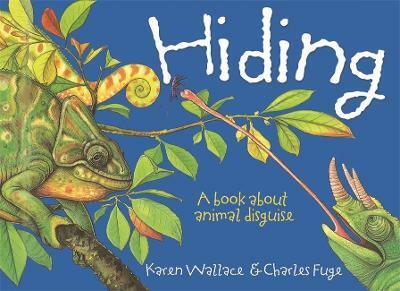 The world of animal disguise is rich and colourful - a hunting tiger's coat can cleverly blend into long grass, a harmless fly will pretend to be a fierce hornet and an opossum will play dead. A Canadian, Karen Wallace gained a degree in English from London University. Shortly afterwards she and her husband went to Toronto and worked in the publishing business. A few years later they moved to Ireland with their two young sons, and returned to England in 1982. She now writes full-time for children and for children's television. She and illustrator Mike Bostock won the TES Information Book Award for THINK OF AN EEL (Walker Books). Her novel RASPBERRIES ON THE YANGTSE was short-listed for the Guardian Award. She is married to novelist Sam Llewellyn. Charles Fuge's picture book debut won both the Macmillan Prize and the Mother Goose Award. Since then he has illustrated more than thirty picture books, including the bestselling Little Wombat stories. He lives in Dorset with his partner, Sarah, and their son Ollie.